Cadbury Wispa is back and this time it's (to quote Take That) Back For Good. 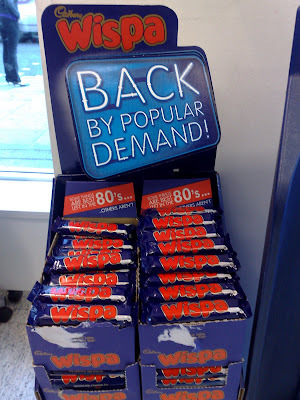 Wispa was originally brought back last year for a trial period in response to Facebook Groups demanding the return of the Wispa chocolate bar. After the 2007 test, Cadbury's have decided to bring back Wispa permanently. Wispa is not the only confectionary product to make a comeback though. Opal Fruits have returned to the UK (10 years after they were renamed Starburst) and the name 'Marathon' could be re-instated to 'Snickers' bars 20 years after it was originally dropped. The re-adoption of local market distinction is an interesting backtrack from the increasing globalisation of products and brands that we have seen in recent years. As times move ever more quickly, then the consumer craving for nostalgia seems to be getting stronger. The New York Times argues that throwbacks and nostalgia driven products are particularly appealing in times of economic turbulence. Consumers are more likely to return to what they know, stores are more likely to give space to the tried and tested and manufacturers are tempted to reinvigorate old formulas rather than invest significantly more in NPD. However, whilst a number of 'new' products may be grounded in old ideas, marketing needs to adapt to the modern age. Young audiences particularly are fully versed in digital and expect to be able to interact with products and even customise them. Thus whereas original Noddy existed on TV and in books, new Noddy also has his own online community with video, games, UGC and E-commerce. It will be interesting to see if the worsening economic outlook drives further nostalgia driven products and also to look at how these are brought to life across digital platforms that didn't exist when they were first around. UPDATE: Monster Munch crisps are another good example of a product going back to its roots. The individual crisps have returned to their original size and the packets highlight that they are now 'old' rather than 'new'. 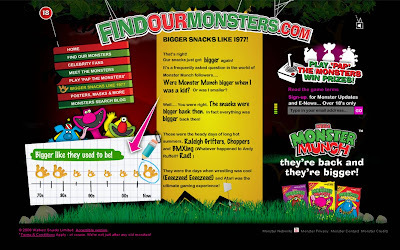 Monster Munch have also launched a quest to find the monster suits from the original TV ads and have produced a viral with Timmy Mallett and a website, http://www.findourmonsters.com, to co-ordinate their search.